The governance of African football is set to undergo significant change, predicts the man who organised the 2010 World Cup. Now President of the South African FA (Safa), former World Cup CEO Danny Jordaan also works now as special advisor to Issa Hayatou, the long-standing president of the Confederation of African Football (Caf). Jordaan was speaking after a Fifa seminar in Johannesburg, described by Caf Vice-President Suketu Patel as a 'watershed' for the continent's football future. While a campaign to increase Africa's allocation of five places at the World Cup is underway, Jordaan said attendees were left in little doubt as to the importance of putting their financial accounts in order. "Very often, administrative and financial problems have created or stunted African football's growth and progress," he told BBC Sport. "Now that Fifa has established the independent Audit and Compliance unit, they will select - on a sample basis - national associations on the continent (whose accounts will then be audited). "That will help us to really keep the focus on the essence of football associations' core business - and that is to provide a quality service and competitive teams." Jordaan added that Fifa's ability to spot-check any football association at short notice applies to all global nations, although it may make the most change in Africa - where, as the South African explained, football administration has often left a little to be desired. So it was significant that integrity matters, good governance and transparency were high on the agenda at the three-day conference. "The seminar was all about establishing new benchmarks for the administration and organisation of football on the continent," he added after it closed on Friday. The 28 national associations that were in attendance also took the decision to ask Fifa to increase Africa's number of berths at the World Cup. The allocation is normally five, although this increased to six when South Africa hosted the continent's first finals four years ago. Nonetheless, no more than one African nation has ever reached the knock-out stage at any World Cup. "The allocation of Africa's World Cup slots is based on a decision taken in 1994 at the FIFA congress in Chicago, just ahead of the World Cup in the United States," he explained. "When that allocation was made 20 years ago, was African football still at the same place? And if not, what progress has been made - and is there a case for an argument of increasing the number of slots for the African continent?" Jordaan is keen to bring these issues to the table at the Fifa Congress in Brazil, though he suggests it may be after the World Cup. Alongside African champions Nigeria, Ivory Coast, Ghana, Algeria and Cameroon are set to compete in Brazil. No African side has ever reached the semi-finals, although Ghana were a penalty miss away in 2010, while Cameroon (1990) and Senegal (2002) make up the three sides to have reached the last eight. 2010 hosts South Africa are notably absent from June's finals but Safa was decidedly grateful that football's world governing body had given the continental game such unwavering support. 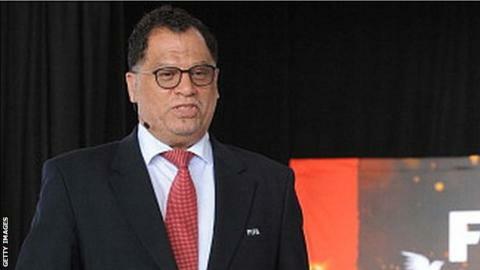 "It was an honour for Safa to host such a seminar," Jordaan said.